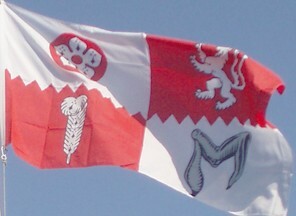 Quarterly per fesse indented argent and gules, in the first quarter a torteau charged with a cinquefoil ermine, in the second quarter a lion rampant double queued also argent, in the third quarter an ostrich feather ermine, and in the fourth quarter a maunch sable. For those who don't understand heraldic language: the flag is divided in four fields; the division between the first and third, and the second and fourth fields, is indented. The first field is white, with a red disk with a white cinquefoil with ermine; the second field is red with a white double-tailed lion; the third is red with an ostrich feather with ermine; the fourth field is white with a black sleeve. The coat of arms was granted on the 25 January 1930. I don't know when the flag was adopted or first used. I has proportions of 2:3. The cinquefoil was the seal of Robert de Beaumont (sometimes spelt Bellomont) who was the grandson of the first Earl of Leicester. It is suggested that the cinquefoil represents a five-petalled flower called the pimpernel, in a punning reference to his mother who was a Fitz-pernell. He died in 1206 and the earldom passed to his sister's husband Simon de Montfort whose forked-tailed lion was described by the heralds in Anglo-French as, 'de gules ove un leon blank la cowe furchee'. The zig-zag divisions of the quarters also derive from Simon de Montfort who held the Honour of Hinkley in Leicestershire, the arms of which consisted of a shield parted palewise indented silver and red. Simon de Montfort was killed at the battle of Evesham in 1265 after leading an initially successful revolt of the barons against King Henry III, who now conferred the earldom on his son Edmund who was also Earl of Lancaster. His grandson ultimately passed the title to John of Gaunt, Duke of Lancaster, represented by the ermine ostrich feather. When John of Gaunt's son ascended the throne as Henry IV, the earldom was merged with the Crown. The forked-tailed lion also represents Lord Robert Dudley who was created Earl of Leicester by Queen Elizabeth in 1564; though his lion was green on gold.. They appear to have run out of earls for the fourth quarter, and the sleeve comes from the arms of the Hastings family, Barons of Loughborough. Conservative MP for Bosworth David Tredinnick said: "There is no long tradition of flag flying in Leicestershire and I think that is because it's not really a very old symbol – certainly nowhere near as old as some other counties which have ancient symbols going back to the War of the Roses." A spokesman for the county council said: "We fly the flag from the central pole of the County Hall every day. When we fly the Union flag we move the county flag to one of the outside poles as no flag can be flown in a more superior position than the Union flag." The county flag is not flown from Leicester Town Hall. A city council spokesman said: "We fly the Union flag daily. There is also a civic flag with the Leicester civic crest upon it and which is flown for civic events."